Click through the ArtBridges Resource Portal to learn more. Click through the ArtBridges Resource Portal to read the full document. 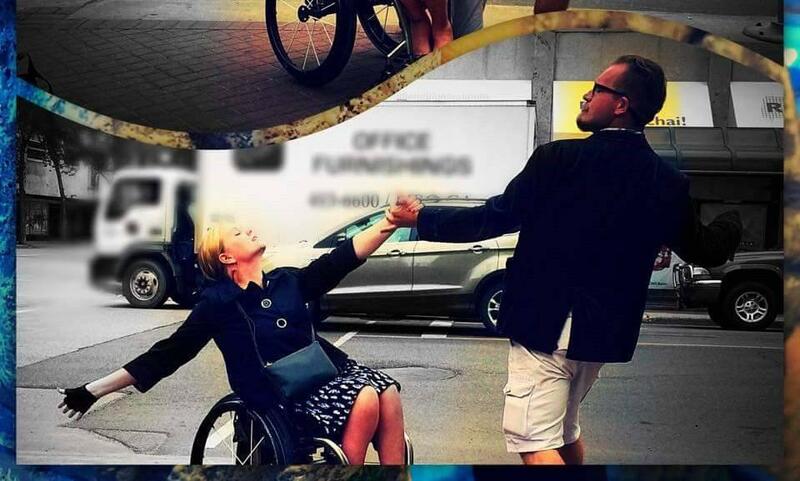 “On nous a demandé à nous, Heath Birkholz et Harmanie Taylor, de partager nos connaissances sur la danse intégrée et l’art réalisé par des personnes ayant des handicaps. Nous avons bien réfléchi à ce que chacun de nous pouvait offrir en fait de conseils. Nous espérons que notre expérience pourra être utile à d’autres artistes ou au public en général. Conseils et outils no 4 : « Art, danse et handicaps » a été rédigé par Heath Birkholz et Harmanie Taylor, et coordonné par Emily Hutcheon. 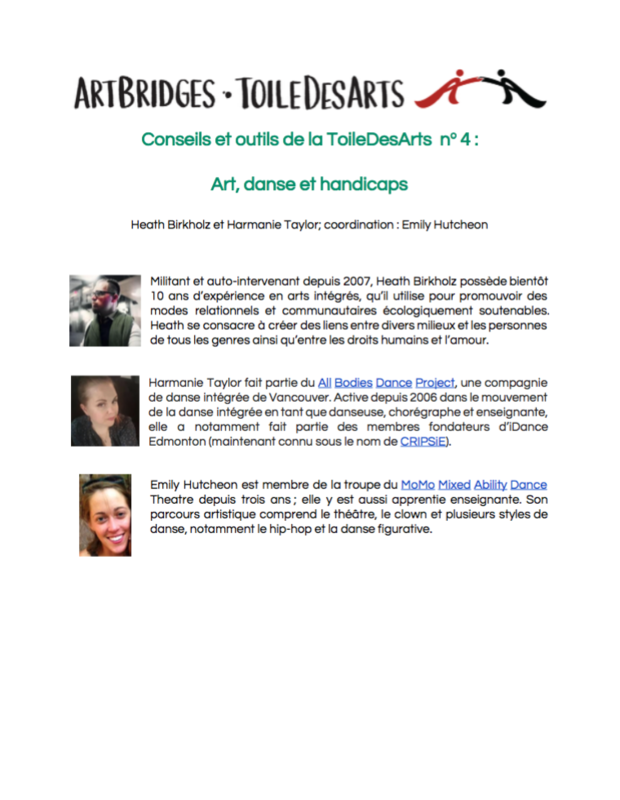 Découvez le travail d’Heath, Harmanie et Emily : MoMo Mixed Ability Dance, CRIPSiE et All Bodies Dance Project. La série Conseils et outils 2016 d’ArtBridges/ToileDesArts a été réalisée grâce au soutien financier de la Fondation Trillium de l’Ontario et traduite en français grâce au programme d’appui à l’interprétation et à la traduction du ministère du Patrimoine canadien. A recipe to support artists working in communities. Created by Julie Frost of VIBE Arts, includes tips on safety, policies, collaboration, roles and responsibilities, hiring, documentation, and organizational values. Recommended for organizations who work with community artists. Click here for the full ArtBridges Tips & Tools: Recipe to Support Artists Working in Communities. For more FREE resources and tools like this, please visit the ArtBridges Resource Portal or reach Skye Louis, ArtBridges Info Resource Developer at skye@artbridges.ca. To learn more about VIBE Arts, please visit www.vibearts.ca. Recipe to Support Artists Working in Communities was written by Julie Frost and compiled by Skye Louis. The 2016 ArtBridges Tips & Tools Series is funded by the Ontario Trillium Foundation. There are many different motivations for wanting to document a community arts project, and there are many ways to go about it. 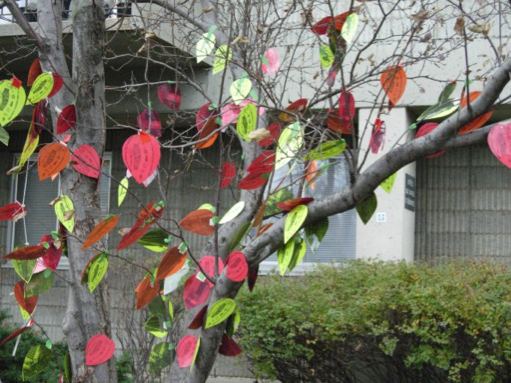 Artist, art educator, and researcher Pohanna Pyne Feinberg of Inspire Art has taken a close look at approaches to documenting community arts projects and shared the results through a free online toolkit called Documenting Community Arts. Created in partnership with SKOL-CEDA Community Projects, this resource for community artists presents key ideas related to documenting a project. 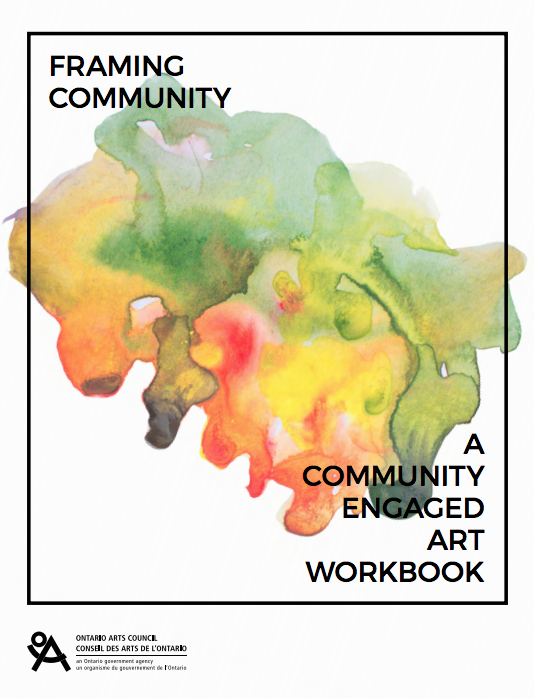 Inspired by actual community projects and designed for participants of community art projects, this guide will be particularly useful for groups who want to document their projects but don’t have a budget or strong technical skills. These groups will appreciate the basic technical tips and info about tools that are free to use. Included are ideas for how to document work in different mediums (photo, video, text, audio), and some useful resources for pulling everything together and sharing it online. This info is paired with actual examples of image and text-based documentation from SKOL-CEDA projects. 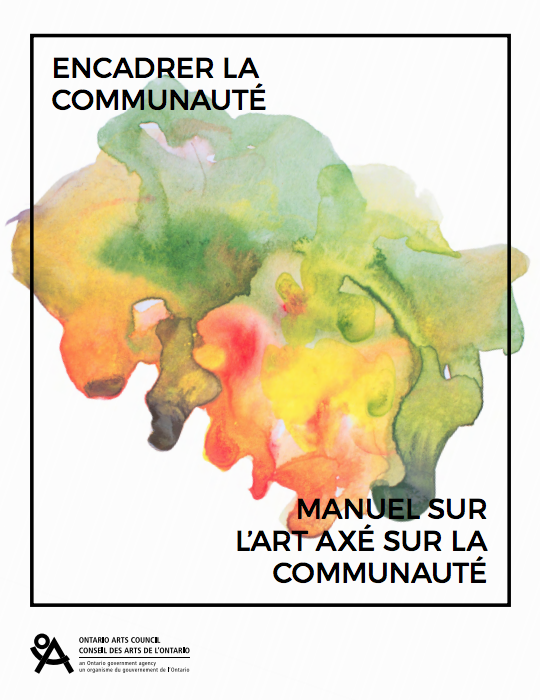 The section about planning for documentation, discussions to have with participants, the sample Distribution Agreement, and notes about inclusive documenting are all relevant to participants of community art projects. For anyone who is interested in learning more about the dynamics of documenting collaborative creative projects, Pohanna Pyne Feinberg’s thesis paper, Making the Invisible Visible: Documenting the creative process, examines documentation in relation to public memory, shared authorship, and social agency. To learn more about Documenting Community Arts Projects and Making the Invisible Visible, please visit the ArtBridges Resource Portal. To learn more about Pohanna Pyne Feinberg’s work, please visit Inspire Art. Read past Featured Resource posts. The ArtBridges Resource Portal connects you to community arts toolkits and research, reflections and stories, program ideas, and more. 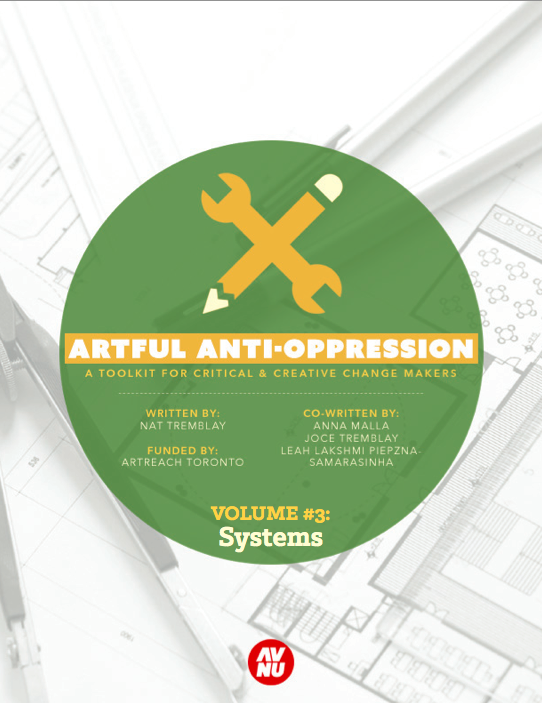 These resources have been developed and generously shared by artists and cultural workers in Canada through the course of their work. 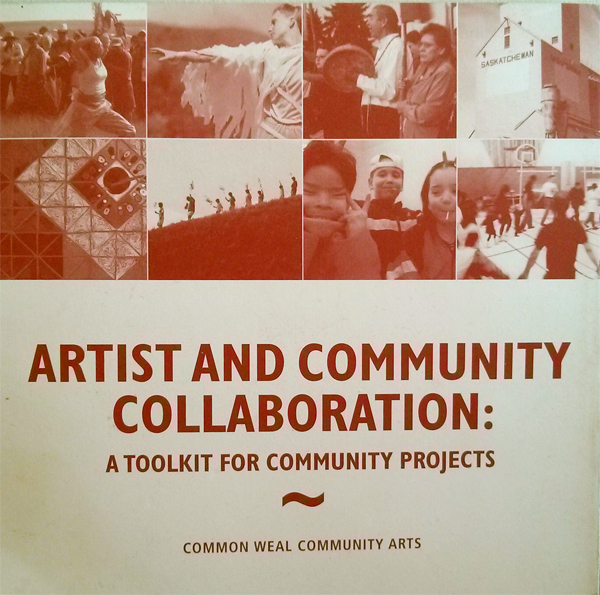 Created by Common Weal, Artist and Community Collaboration: A Toolkit for Community Projects is designed for artists or community members who are starting or involved in collaborative community projects. This toolkit contains a diverse assortment of resources, ranging from discussion of ideas grounding collaborative work (values, ethical considerations) to a checklist for getting started, planning worksheets, sample consent forms, and icebreaker activities. Divided into 7 main sections (Initiate, Engage, Collaborate, Organize, Strengthen, Sharing, Completion) with special section of tools, templates and activities, this is a very rich resource. Thoughtfully constructed, each section mixes narrative with checklists, case studies, and tips. Common Weal is a groundbreaking community arts organization that has been based in Saskatchewan for over two decades. Common Weal impacts communities who are under-served or who do not presently access mainstream arts programming and works towards changing the lives of the people involved in a positive way. 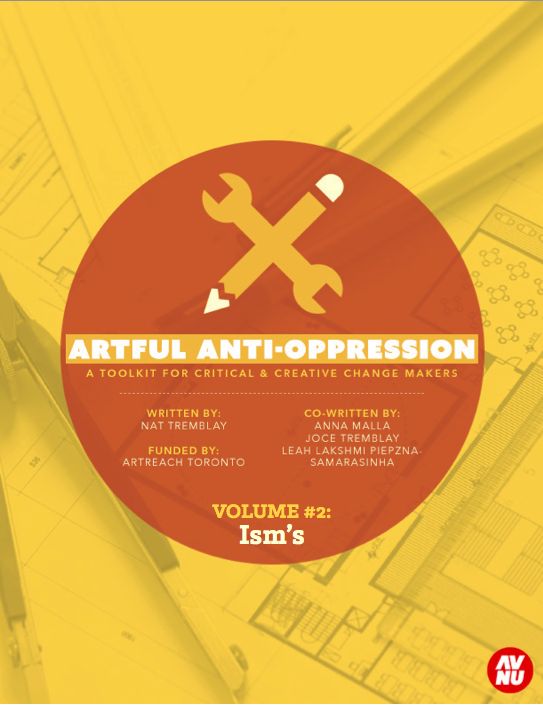 For artists or community leaders who are looking for resources, tips and ideas, this toolkit is a real hidden treasure that is not available online. A hard copy can be obtained through the Common Weal office for $15; please contact infocommonweal@sasktel.net to learn more. To learn more about Artists on Ice and Uprooted Generation, please visit the ArtBridges Resource Portal. Artistic Storefronts are an inspiring way to bring art, business, and community together. Using storefront space to showcase art is an innovative way to enliven existing spaces, and can inspire community members to connect with one another. Inspired by festivals such as New Glasgow’s Art at Night Festival and the Hamilton Supercrawl, Arts Network for Children and Youth (ANCY) has published a special toolkit for youth who want to get started on planning their own downtown arts festival. Created by Rikhee Strap, How to Set Up and Create Artistic Storefronts lists some clear and easy-to-follow approaches to connect with businesses and activate empty storefronts with art. National Youth Arts Week (organized by ANCY) takes place annually in May, and is an ideal time for youth to connect with businesses and maybe even start up a festival in their community. 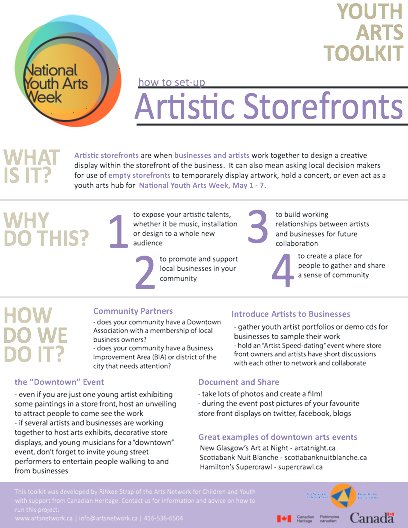 To learn more about How to Set Up and Create Artistic Storefronts, please visit the ArtBridges Resource Portal.